Love the cover design, love the crazy/quirky editorial and LOVE the Miu Miu. Wow, I love the style of this sooooooooooooooooooo much! oh my gosh, I'm so gonna go buy me one of these!! hope it gets over here soon. Ahh I'd buy it for the cover alone, but I'm sure the inside will be even more amazing. And that interview looks so gorgeous, can't wait to read it - miss Sevigny is so lovely. I was going to pick this up on the way back to Aus, just because of the cover! Love this editorial! Especially in love with miu miu, and who wears it better than chloe?! She was one of the first faces of miu miu and even today, completely suites its style, as it does her. I must get this issue! gosh, she looks stunning and the layout is fun! Oh this is so cute. I love how the pictures are interrelated with those words. she is amazing, such great style and so pretty!! 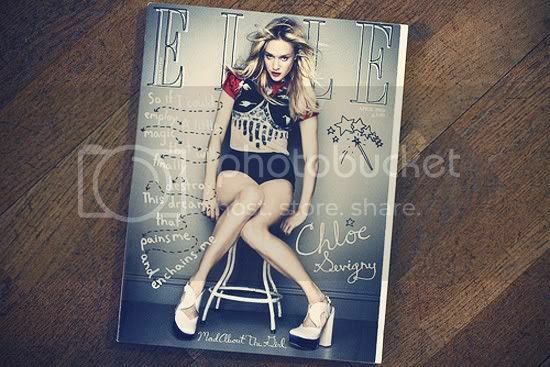 I love all the photos and the layout, chloe is very amazing girls, love her style soo much! Love this edition of Elle, this one and the ones of Courtney Love, Lily Allen and Ashley Oslen are my fav covers of all time from Elle. this spread looks amazing, its so quirky. I own this Elle and I must say she is just a dream, I loved reading her interview. i love this editorial. its so funn and light hearted. and of course those miu miu shoes are just perfection. every girl should own a pair!! Oh lordy this is incredible. It's so rare to find a commercial magazine willing to do something unique! Could I add your blog in my links?